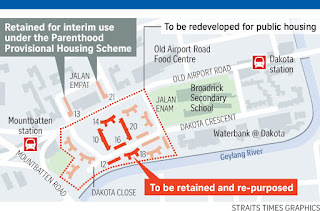 Mr Wong said the redeveloped estate could be a mixed-use area, with new HDB flats, "adaptive reuse" of some of the old blocks, and amenities and community spaces. An Urban Redevelopment Authority spokesman said agencies are still working out possible options for reuse, which could range from "community uses" on the ground floor to work spaces or hostels on the upper floors. 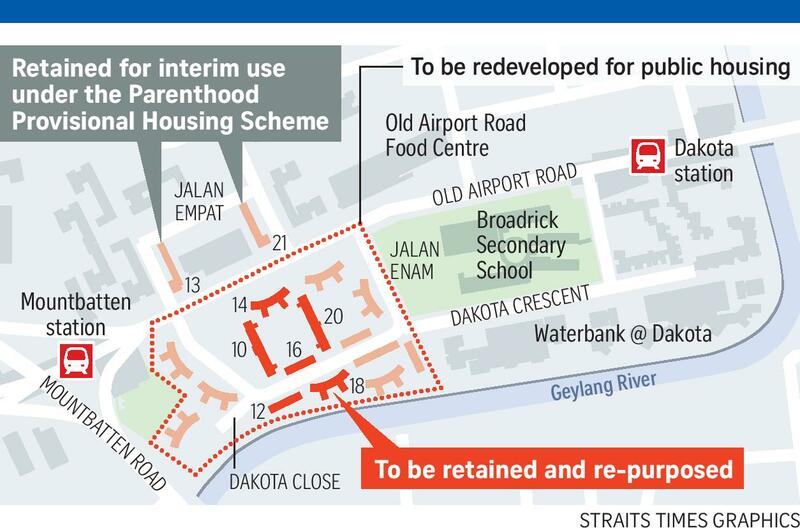 Asked for more details about the public housing development at Dakota Crescent, an HDB spokesman said it would provide them when they had been "firmed up". MP for Mountbatten Lim Biow Chuan, who had previously called on the Government to reconsider plans to redevelop the historic estate, was pleased about the decision to retain the six blocks. "It's not just about retaining buildings but retaining memories. A lot of residents spent time at the playground," he said. He welcomed the move to use the estate for public housing, which he said would keep the area accessible to the public, and expressed hope the six repurposed blocks would not be filled with offices and commercial properties that "would take away the essence of what Dakota Crescent was". Mr Wong said the ministry will "continue to engage stakeholders and involve the wider community" as the area is redeveloped. 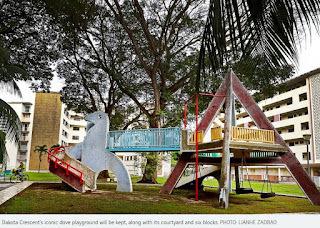 The historic Dakota Crescent housing estate may be slated for redevelopment, but its courtyard, playground and six blocks will be kept. Most of the advocates and former residents The Straits Times spoke to welcomed the announcement by National Development Minister Lawrence Wong yesterday. There are 17 low-rise blocks in the estate off Old Airport Road. Architect Jonathan Poh, who started the Save Dakota Crescent campaign in 2014, said he was "encouraged" by the decision to keep the six blocks, even though he and a group of residents had last year submitted a conservation report to save twice that number. He hopes they might be used by social enterprises or couples waiting for Build-To-Order flats. Keeping the neighbourhood accessible to people from all walks of life, including seniors and lower-income groups, would be key, he said. "I hope Dakota Crescent doesn't become gentrified." Last year's conservation report had proposed turning the area into a mixed-used complex with residential units for rent,food and beverage outlets and offices. The distinctive architecture of the six blocks is a good sample of the estate's unique features. 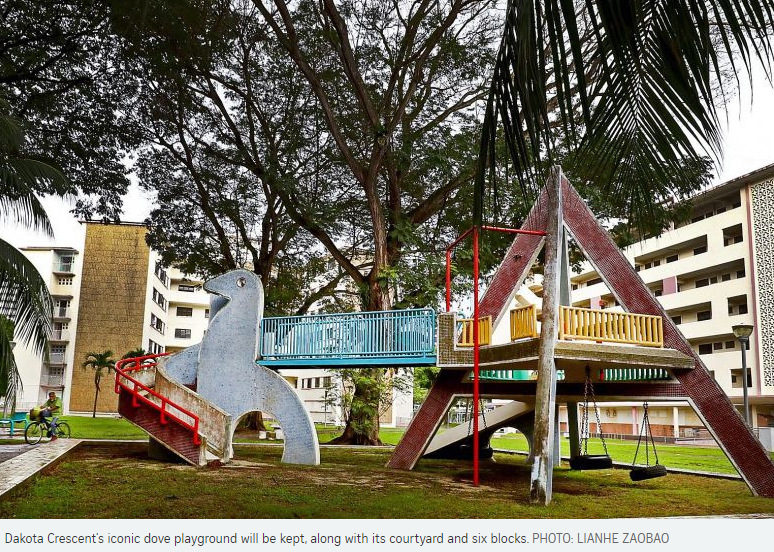 Blocks 10 and 20 are similar to the British-built blocks that used to be in St Michael's estate in Whampoa, and the Princess and Duchess estates in Queenstown, Mr Poh said. The two slab blocks have alternating balconies and walls along their corridors. They are the last of their kind here, according to him. In these two blocks, the kitchen faced the corridor, while the bedrooms were on the side of the external facade to receive as much sunlight as possible - like homes in temperate countries. "Those blocks had lots of heat problems," said Mr Poh with a chuckle. Former Dakota Crescent resident Jeffrey Lin, 45, who grew up in a three-room flat, has fond memories of the "very old-school lifts", which stalled often. He said: "Residents would be happier if they could retain all the buildings, maybe as hostels. They are historical places, and the area is not very big." Mr Lin, who now lives with his father in a two-room flat at Block 52, Cassia Crescent, home to many former Dakota Crescent residents, added: "In the old houses, the space was bigger. And everyone knew each other, but we still had our privacy." Retired cleaner Yee Dew Eng, 78, was happy about what would be kept, but mourned the loss of the old flat in Block 30 she called home for nearly four decades. "These are relics from the past. And the fengshui there was better," she said in Mandarin.